The global automotive drive shafts market has been gaining steady momentum in the recent years with the accelerated production of vehicles across the world. These mechanical devices carry power from the engine to wheels. As automotive drive shafts have to put up with extreme pressure and stress, they have designed to be strong and light weight to ensure absorption of torque of the engine. The drive shafts have to be light weight in order to reduce the weight of the vehicle. Owing to the excessive demand for vehicles across the globe, the demand for automotive drive shafts has also risen. According to the research report, the global automotive drive shafts market is expected to be worth US$8.9 bn by the end of 2024 as compared to US$5.3 bn in 2015. During the forecast years of 2016 and 2024, the global market is estimated to leap ahead at a CAGR of 6.1%. 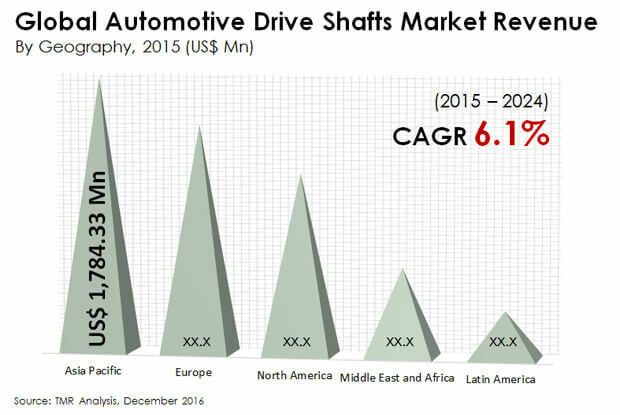 The global drive shafts market has been growing against the backdrop of rising production of automobiles. As the global automotive industry has been growing at a relentless speed since the 2008 economic depressing, it has ensured the revival of production of several automobile parts. Analysts predict that the automobile industry will continue to grow in the coming years, spelling a positive outlook for the overall market. The demand for automotive drive shafts will also remain steady in n the after sales services segment as these critical components of vehicles have to be replaced due to their wear and tear over time. The only hindrance in the global automotive drive shafts market is the emerging trend of electric vehicles. Electric vehicles operate on batteries, which are charged by electricity, thus eliminating the need for shafts completely. The global automotive drive shafts market has been segmented on the basis of vehicle into passenger vehicles, heavy commercial vehicles, and light commercial vehicles. Out of these, the heavy commercial vehicles are expected to show remarkable progress over the forecast period. As heavy commercial vehicles form the backbone of the economy, they will continue to demand automotive drive shafts more than the other segments. These shafts will be predominantly be used for heavy duty trucks that are used for transporting foods across national and international borders. In terms of geography, the global automotive drive shafts market is segmented into North America, Asia Pacific, Europe, the Middle East and Africa, and Latin America. Of these, Asia Pacific is anticipated to grow at the highest CAGR during the forecast period. The booming production of vehicles in emerging economies of India, China, and Japan is expected to drive this regional market in the coming few years. The heavy commercial vehicles are estimated to hold the dominant position in Asia Pacific automotive drive shafts market, while the passenger cars will be the second largest segment. The rising economic activity in this region along with soaring capital investments is expected to provide the Asia Pacific automotive drive shafts market an unwavering support all through 2024. The key players operating in the global automotive drive shafts market are GKN PLC, American Axle Manufacturing Inc., Dana Incorporated, Nexteer Automotive, Xuchang Yuangdong Driveshaft Co., Ltd., and Neapco Holdings, LLC, among others. The automotive drive shafts market across the globe is anticipated to witness a stable growth during the forecast period from 2016 to 2024. Automotive drive shafts are mechanical components used for transferring torque from the engine to the other end of the vehicle before it reaches the wheels. These components are automotive drive shafts made up of steel, aluminum and carbon fiber. Automotive drive shafts made of aluminum are light and sturdy at the same time which enables the drive shafts to be balanced, produce more rotating speed and also reduces the overall weight of the vehicle. Aluminum drive shafts are light and sturdy, enabling the overall weight of the vehicle to be light and require less fuel. Aluminum drive shafts are also more balanced and produces more rotating speed. Steel drive shafts are very heavy and requires a lot of horsepower to transmit torque and rotate. It makes the overall weight of the vehicle very heavy, requiring more fuel to run. .
By types, the market has been segmented into hotchkiss drive shafts, flexible drive shafts and torque tube drive shafts. Hotchkiss drive shafts are the most popular form of shafts used for rear axle suspension and are commonly found in heavy commercial vehicles and passenger cars. Flexible drive shaft types have high longevity and permits continuous rotation in vehicles even at high speed. These are mostly found in passenger cars and light commercial vehicles. Use of torque tube drive shaft is comparatively less widespread than hotchkiss drive shaft system and flexible drive shaft system. It is mostly found in heavy commercial vehicles with front engine and rear drive. Torque tube drive shaft types are typically heavier and produces greater up sprung weight on the vehicle. The automotive drive shafts can also be judged based on their position which in turn depends on whether the vehicle is Front Wheel Drive (FWD) or Rear Wheel Drive (RWD). Front Wheel Drive vehicles are always the preferred choice since they are more fuel efficient and weigh less enabling the vehicle to be aerodynamic. The FWD vehicles also cost less compared to RWD vehicles, therefore their production and use is higher. In recent years, all the passenger cars and light commercial vehicles are FWD and their drive shafts are placed likewise. This positioning also protects the vehicles in case of accidents. The report also discusses the demand inducing and demand restraining factors. The main drivers have been identified to be the rise in production of vehicles and depreciation of drive shafts whose replacement is supported by an efficient after sales services sector. The global automotive industry is in a reviving phase and is expected to show promising performance over the forecast period. APAC is the largest producer of automotive and is likely to maintain its dominance the forecast period. In recent years the APAC region has witnessed notable performance in terms of its GDP and development of its automobile and automotive parts industry. India, Singapore, South Korea, and Thailand, among other countries in APAC have high growth potential. This region has also experienced a sudden rise in disposable income, enhancing the affordability of passenger cars. Use of electric vehicles however, is expected to reduce the need for drive shafts since they run on battery which are charged by electric power. Therefore, this factor is anticipated to pull down the growth of the automotive drive shafts market. This report provides the future anticipated market growth of automotive drive shafts during the period from 2016 to 2024 along with a current market synopsis. The report also provides in-depth analysis of the automotive drive shafts market across various vehicle types, shaft types and position types. Various economic factors predicted to affect the demand and supply of automotive drive shafts across the globe are also highlighted in this report. In addition, the report also sheds light on the detailed industry structures, market share of the leading manufacturers and future predictive demand and supply in terms of revenue in order to provide a detailed analysis of the market. By geography, the global automotive drive shafts market has been further classified into North America, Europe, Asia Pacific, Middle East and Africa (MEA) and Latin America. The present market size in terms of revenue (USD Mn) along with forecast from 2016 to 2024 is also provided in this report. Some of the key players operating in the automotive drive shafts market across the globe are, GKN PLC. (U.K.), American Axle Manufacturing Inc. (U.S.), Dana Incorporated (U.S), Xuchang Yuangdong (U.S.), Neapco Holdings, LLC. (U.S.) and The Timken Company (U.S.), among others.